Well, last week at PAX, Razer pulled back the curtain to their aggressive marketing campaign debuting the Blade to the expo attendees. The Blade is Razer's first attempt at actual PC hardware and the compact gaming laptop is a sight to behold. 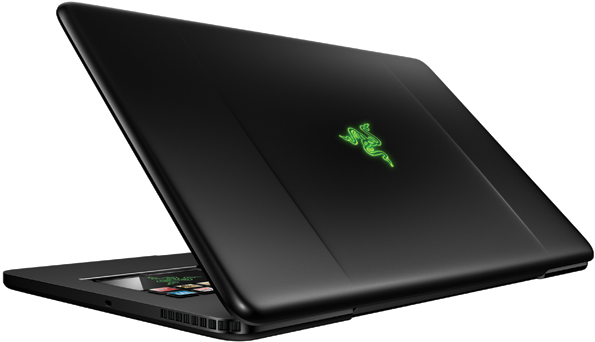 There are a lot of exciting features packed into the Blade, and at first glance the price of admission may seem high, but take a closer look and I think you will see why the Razer Blade may be worth the investment. Alienware is arguably the biggest name in PC gaming and they have a significant presence in the gaming laptop market. Unlike Razer, Alienware has performance tiers and customization options for you with their gaming laptop series. The top of the line Alienware M18x starts at $3199.99. The M18x features an 18.4" LED screen and if you go mad, can run a 500GB RAID of two 256GB SSDs, Dual NVIDIA GeForce GTX 580Ms running SLI, 32GB of DDR3 RAM and an i7 quad core overclocked to 4.0GHz. The chassis is quite robust in order to house all of that tech and your pocketbook better be as well since that set up will run you well over $7,000.00. Conversely, the only options available on the Blade are different. The CPU can be overclocked to 3.5GHz and that's where the hardware options end. However, with the slick Switchblade LCD UI, the options are pretty expansive. Since it has multi-touch capabilities married to full motion video functionality, the Switchblade UI offers a sort of utility not found on any other laptop. Stuck on a particular level? No problem, go to youtube and watch the walkthrough on the Switchblade UI screen while you play through the game. Most games will have a standard UI to work with the LCD control screen, but for those not interested, the screen can double as a multi-media player and a touchpad for those moments on-the-go when you don't have a mouse. The Blade also features 10 programmable dynamic keys that are adaptive and can have a matching icon overlay displayed on them. The keys sit right above the multi-touch display panel. Gamers will be able to map the keys to specific functions and even create macros with them depending on their gaming preference. When taken in as a whole, the features packed into the Blade should turn it into a tour de force. The Switchblade UI and adaptive keys really have potential for exciting things in PC gaming and will most likely be a welcome to most gamers of RTS, FPS and MMORPG games. If the size (17" LED screen and less than 1" thick), sleek design (less than 7lbs), and slick new control ideas aren't enough, Razer will also be allowing users to develop custom UI's that can be shared with other Blade owners. At a price of $2799.99 the decision to not go Blade isn't as clear as it may seem.